Bowie – Ziggy So, that seminal moment – just like ten years before when we first heard The Beatles, Ziggy arrived in 1972. And we all got it. Straight away. Ziggy was some weird androgynous creature arrived from outer space with a great rock and roll band and all the right songs and all the right moves. Boys and girls were both in love with Ziggy with his mop of red hair and white face and bright green and sparkly cat suits and white heeled boots. And of course, like everyone else I ran out and bought the record – The Rise and Fall of Ziggy Stardust and The Spiders from Mars. Take back what I said about Hunky Dory – this is the Bowie album….the songs are incredible; from the apocalyptic ‘Five years’ to ‘Rock and Roll Suicide’ – all brilliant. Not a poor song on the record. David’s singing is immaculate, the band really rock and Mick Ronson’s guitar floats above everything.especially on ‘Moonage Daydream.’ And listening again 46 years later – the thrill is still there. The album was supposed to be a one-off – the last song killing off Ziggy, but somehow he began to take over Bowie as he toured the country. And Ziggy stayeded for another two records. Alladin Sane (Ziggy in another faint disguise) came out in ’73. Another brilliant album, written apparently while Bowie was touring the States. He had recruited Mike Garson, a jazz pianist – and his influence is all over the record. A very jazzy feel to some songs. But in some ways this is a more disjointed record, a couple of rockers, the singles ‘Jean Genie’ (not my favourite) and ‘Drive in Saturday’, the fey ‘prettiest Star’ and a torch ballad ‘Lady grinning Soul’/ But Bowie was God by now and could do no wrong. Listening now, I am struck by how sexual the record is, which of course was a large part of the Ziggy persona. 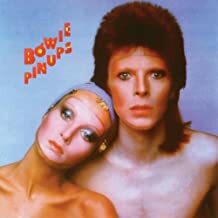 Later the same year came ‘Pin-Ups’; a modern covers album, which may have been a cash-in disc but was actually almost as good as Hunky Dory and Ziggy itself. With its brilliant cover photo of David and Twiggy it makes up the trilogy of Ziggy albums. This is a great album, even if it is covers -Ziggy (Bowie) ‘s voice has never been better. He out Daltreys Roger on the two Who tracks. He re-invents ‘See Emily Play’ and gave us another great single with ‘Sorrow’. Best of all is ‘Friday On My Mind.’ This record always cheers me up !